You are smarter than you think. – Pooh often speaks of how small his brain is, yet he always manages to boil down life’s issues with simple, elegant wisdom. He teaches us that knowledge doesn’t need to be complex. A sweet tooth can sometimes get you into trouble. – His constant craving for honey will get Pooh into a bind at times, and he often needs help getting himself unstuck. Fortunately, he’s got friends to help him out, and gets plenty of exercise in the process. Balance is important to healthy living. – A healthy appetite is a good thing as long as it is balanced by an active, healthy lifestyle. 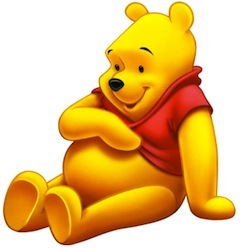 Pooh shows us the danger in overeating, and a lack of moderation. Nothing is beyond your reach when you persevere. – When Pooh stretches, climbs and struggles for honey, it takes every ounce of strength and effort to get there. He knows that it takes determination to achieve one’s goals. It’s OK to ask for help when you get stuck. – Try as he might, sometimes Pooh needs some help from his friends when he’s trying to get to that honey. He knows he can count on others when a job is too big to tackle alone. True friendship means putting others first. – Winnie the Pooh loves his honey alright; but he’s always willing to help out a friend even if it means skipping a snack or two. He’s willing to put a friend’s needs ahead of his own desires when necessary. Even our failures can be blessings. – Things don’t always work out quite the way we’ve planned or hoped, but Pooh shows us that it’s always for the best. He learns something important each time, about friendship, sacrifice and love. Friends come in all shapes and sizes. – The gang from Hundred Acre Wood is a diverse group of characters, with their own individual strengths and challenges. Each of them complements one another, and is equally respected as a member of the community. There is beauty and strength in diversity. – Pooh helps us to recognize that in their differences, the inhabitants of Hundred Acre Wood illustrate a beautiful tapestry of all walks of life that holds together through every challenge they encounter. You are loved more than you know. – All of his friends, as well as generations of children around the globe, have grown to love Winnie the Pooh, warts and all. No matter how simple-minded he thinks he is, or how much honey he eats, he is loved unconditionally.